A British mother says her daughter committed suicide after suffering an “allergy” to Wi-Fi. 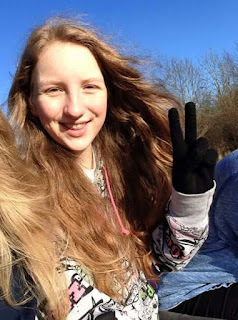 Jennifer Fry was just 15 last spring, when she hanged herself in the woods in Oxfordshire — and her parents Debra Fry and Charles Newman blame wireless signals inside her school. The parents claim the signals caused Electromagnetic Hypersensitivity Syndrome, with severe headaches, nausea and fatigue as symptoms. They want Wi-Fi removed from preschools and schools and urge the government to research the syndrome. Fry admitted she didn’t take Jenny to the doctor, fearful that she would have been institutionalized or given drugs that the mother was suspicious of because the family knew a boy who had committed suicide after being on antidepressants, according to the Mirror, a British publication. It’s unclear whether “Wi-Fi allergy” exists. Neither the World Health Organization nor the Centers for Disease Control recognize Electromagnetic Hypersensitivity Syndrome as a disease. Neurologist Dr. Dexter Sun of Lexington Neurology Associates and a professor of neurology at Cornell University Medical College, isn’t sure, either, but he said he does have patients who complain of the ailments ascribed to EHS. He acknowledges that some people are highly sensitive to magnetic fields, and though previous studies of cell phones found that they were not an inducement for brain tumors, Sun also raised the spectre that no one knows the long-term effects of any of this technology. John Harris, a Yale University physics professor, also did not discredit the syndrome, and notes how many of the symptoms are similar to stress. The sensitivity could be to a range of electromagnetic waves. Some countries are more open to the syndrome as a quantifiable medical issue. France, for example, recently awarded a woman $900 a month in disability because of her ailments with electromagnetic hypersensitivity. by Debra Fry, posted 3 May 2016On the 11th of June 2015, my 15 year old daughter, Jenny Fry was found by me, hanged in woods near our home in Oxfordshire, UK .She was utterly exhausted; instead of receiving sympathy and understanding, she was battling the school for giving her detentions and refusing to acknowledge her difficulty around wifi, which had a profound effect on her ability to concentrate, write, explain things, and function in school.I went into the school on several occassions to try to educate them on the health dangers to all pupils and staff, as well as the effect it was having on Jenny, but I was told that for as many reports that there are showing harm, there are as many available online saying that wifi is safe (although I have not seen any saying this).The head teacher did say he would double check; I left him a list of information – reports and websites – to check. He also said he could not turn off the wifi for one child; I said it was not just for Jenny, but it would be healthier for everyone. I even had a heated exchange with a member of staff, saying that Jenny is allergic to wifi.It’s the same as a peanut allergy – you would not leave peanuts all around the school, so why expose her to wifi? Knowing that it will cause her problems?They refused to let me measure with my electrosmog meter to find safer, more comfortable areas for Jenny to work in. And they told me off for taking readings at a parents’ evening.I also contacted the Governors of the school, the local Education Department, the Radiation Advisor used by them, the Chief Scientific Officer, the Chief Medical Officer, the National Radiological Protection board, the Health Protection Agency, Public Health England, and my MP and GPs. The family of a 15-year-old girl who hanged herself from a tree says the teen was driven to suicide by an allergy to something that is nearly inescapable in our modern world — Wi-Fi. Jenny Fry, 15, suffered from an acute case of electromagnetic hypersensitivity syndrome, which causes blinding headaches and nausea when victims come in contact with the kind of EM fields created by wireless hot spots, according to the Daily Mirror. Fry says the problem was especially bad at school, where many of the classrooms had their own Wi-Fi, explaining the torment drove her daughter to skip class and act out. The mom told the court she had pleaded with her daughter’s teachers to allow her to work in rooms without Wi-Fi, but the school refused. “The least they could do was allow her to take [classes] in rooms where she felt able to concentrate, but they wouldn’t listen,” Debra Fry said. Fry’s body was found hanged in a tree near her home in the county of Oxfordshire this past June. “I fully believe Jenny did not intend to take her own life,” her mom said. At the inquest on Nov. 19, the coroner said he could not conclusively say the young teen meant to kill herself. He did not attribute her death to electromagnetic hypersensitivity syndrome either, as there are no medical documents to prove it, according to the Oxford Mail. Fry left a suicide note. Since her death over the summer, Fry’s parents have started raising awareness about EHS and the supposed dangers of Wi-Fi. “I am not against a bit of technology, but I do feel schools should be aware that some children are going to be sensitive to it and reduce its use,” Debra told the Daily Mirror. The World Health Organization says EHS symptoms — which include headaches, nausea, fatigue and rashes — are real, though several studies conducted so far have been unable to conclusively link them to Wi-Fi. Parents and teachers are forcing some schools to dismantle wireless computer networks amid fears that they could damage children’s health. More schools are putting transmitters in classrooms to give pupils wireless access from laptops to the school computer network and the internet. Ondes definitively adopted Act !! children; it requests a report on electro-hypersensitivity. so she returned to the shortest possible time. quote Laurence Bee author and rapporteur of this law and encourages them to continue on this path. This law is simply a first at European level! 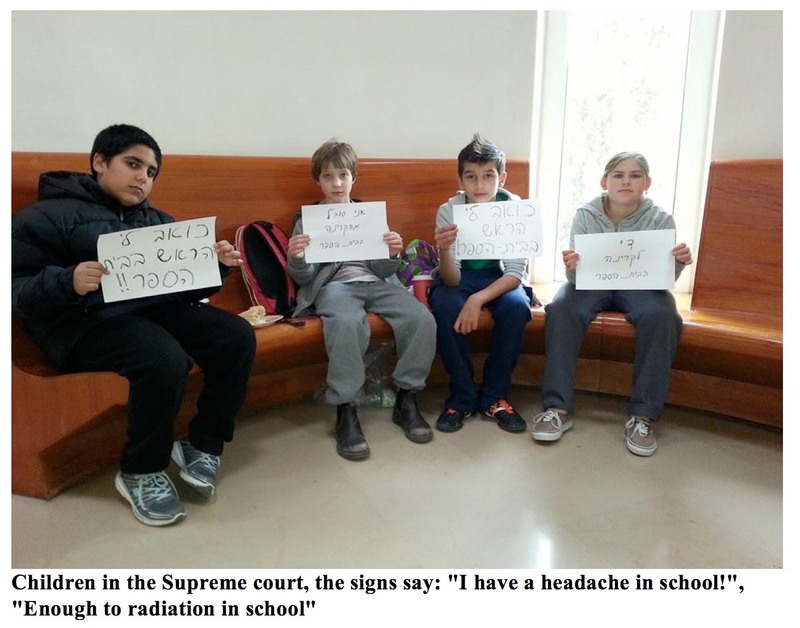 Alarm and panic, that’s how the reactions of parents can be described, after they learnt that radiation measurements in schools found exceeding radiation. The information was spread like fire in thistles field. The members of the school parents board in Zeev school decided with the management of the school, to evacuate 7 classrooms. Parents who heard about it in other schools became stressed, because they did not know the results yet. Then the municipal board threatened to do a strike if they did not receive the report. The report showed exceeding of ELF. The significant exceeding was found in 3 schools. David Swisa, responsible for education in the municipality, said that one of the parents told him that he was informed about a problematic report and that the parents did not receive the report and did not know what it was about. In the municipality they received the report but did not distribute it to others. “I as the responsible for education in the municipality, did not even know that the examinations were done. There was a problem in the way it was managed, and parents thought that the report was hidden from them on purpose”. In one of the schools the library turned into a classroom after the classroom was evacuated, with cooperation of the school principal. The teachers room became a classroom, and the teachers moved to the principal’s office. Afula’s municipality said that two examinations were done – one ordered by the municipality and the other by the Ministry of Education without the knowledge of the municipality. Wireless and cellular radiation that exists in the rooms spaces, was found totally normal, the municipality said. In few cases there was radiation emitted from wireless computers screens that can be removed….All the power workers of the municipality were recruited to correct the flaws and will work with experts. The Ministry of Education said that Tel Dor company was asked to do the examination in all schools in the country, funded by the Ministry of Education. The summarizing report was sent to the head of the environmental unit of the local authority, who guided the school’s principal about steps to be done if exceeding is found. The district is not copied to the report. It’s a report only for professionals”. Chairman of the municipal parents board, Roy Bar, said that there was great panic among the parents. “I receive many phone calls from pressured parents who want answers. The parents wanted to do a strike. People started saying that their children complain on headaches and then they understood why. Everything could have been prevented if they had sat with us in an organized way when the report arrived at the municipality. The examination included 19 schools around the city, 8 of them were found to be OK. In Nofim school there was found exceeding in one of the classrooms, and it was recommended to install shielding to the wall that is close to the electricity board. Exceeding was found also in Moria school in the computers classrooms near the screens, there it was recommended to replace the computers screens to LCD. In Cramim school exceeding was found in the educational consultant’s room and it was recommended to move her to another room.